As early as 800 B.C., researchers believe that cheese was being made in the Netherlands based on the jars that was used for separating the curds. Cheese production in the Netherlands became more popular in the Middle Ages as the wet landscape lent itself towards cattle. Certain cities asked for weighing rights, which would enable them to eventually have a cheese market. These cheese markets are/were where farmers and merchants would assess the cheese prior to auctioning it and weighing it. Today, the Netherlands is one of the largest cheese producers in Europe. Certainly, you’ve heard of Gouda cheese. When is the best time of the year visit the cheese markets and how can you avoid the crowds? In general, you want to avoid April as well as June/July as this is peak season. Quite a few of the cheese markets begin earlier than this peak period and I’d recommend visiting the most popular Dutch cheese markets (Alkmaar and Gouda) in late August or early September (if possible). Not all of the markets run past summer. Although you’ll want to arrive earlier to get a good place at the most crowded ones, the crowds can be avoided if you pick certain cheese markets over others… Keep reading for my picks of the best Dutch cheese markets! The charming city of Hoorn is situated about forty minutes north of Amsterdam. This small city lacks the crowds and the craziness of other cheese markets in the Netherlands, so if you’re looking for a quieter experience, consider heading to Hoorn. If you’ve ever had Beemsterkaas (Beemster cheese), you might be familiar with the cheese from Hoorn. Hoorn was historically a city in West-Friesland that profited from the VOC (Dutch East Indies Company), however, after losing its seaport, cheese became a major industry here. The cheese market in Hoorn took place on the Roode Steen (for the blood from the executions) that took place here. The cheese market in Hoorn is not an active cheese market today (which is the case with most Dutch cheese markets) as it’s more economical for cheese producers to directly collect the milk from the farms without the pomp and circumstance of the cheese market. 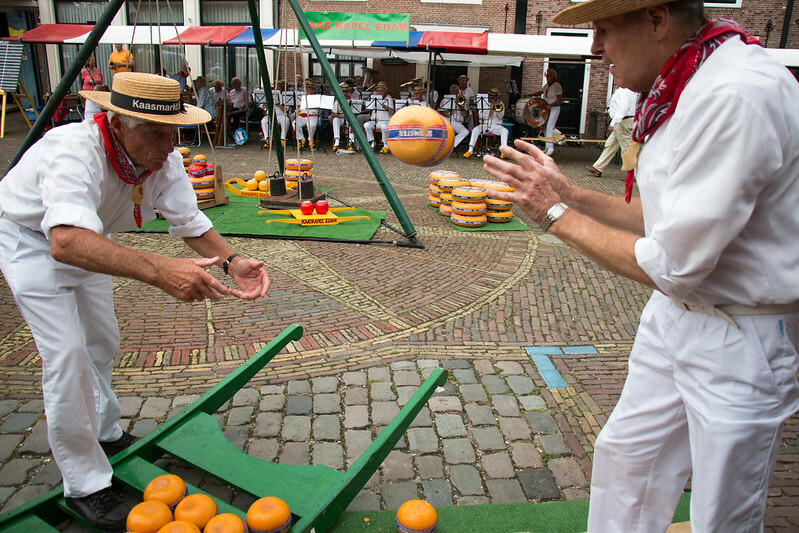 You’ll find the cheese market in Hoorn between mid-June and August on Thursdays in the afternoon. The market generally begins at 13:00. You’ll see the cheese carriers bringing the cheeses in prior to seeing a traditional dance to music. Afterwards, you’ll see the trades start prior to wrapping up around 15:45pm. If you’ll be visiting Hoorn, you can click for my one day guide to Hoorn, which includes a self-guided walk that you can do after the cheese market is over to see the highlights of this gorgeous Dutch city! Gouda is one of the most famous cheese markets in the Netherlands. Gouda itself is about an hour by train from Amsterdam Centraal. Although most people come here mostly for the cheese market, Gouda is a beautiful city with an incredible Gothic city hall, some beautiful streets, and lovely cafes. The Gouda cheese market is one of the most popular cheese markets in the Netherlands, so try to arrive early if you wish to have a good place along the market. It occurs most Thursdays in the morning from early April to the end of August, starting at 10am. At this point, the Gouda cheese market is a reenactment as real trades do not occur anymore, however it’s certainly a show. Surrounding the market, you can buy products although I strongly urge you to buy a fresh Gouda siroopwafel while in Gouda. One of the best places to view the market from above is from the stunning Gothic City Hall, so bring a few euros to pay for entry. This city hall dates back to the 1500s when a fire burnt down much of Gouda. If you have the chance to peek into the wedding room, be sure to do so! Be sure to give yourself at least a few hours to enjoy Gouda without the crowds. Many people leave directly after the cheese market, but Gouda is a beautiful city in itself! Click for my guide to Gouda. One of my favorite cheese markets in the Netherlands is the Woerden cheese market. This off the beaten path cheese market in the Netherlands is one of most authentic Dutch cheese markets as trades are still happening here. I’m biased in saying that I think that the Woerden cheese market is the best cheese market in the Netherlands. Woerden has the most recent cheese market (1885), however farmers have been able to gain higher prices for their boerenkaas (special Gouda cheese produced entirely on one farm) by doing things this way. Here, you’ll see the whole process of purchasing cheese from the inspection to the tasting to the hand-clap method of negotiating the price prior to the weighing. This market isn’t as “instagrammable” as some of the others, but it’s real. Each step is explained briefly to the small crowd that gathers here although if you don’t know Dutch, you can still enjoy the cheese market (including the free samples). You can visit the Woerden cheese market Saturdays between early May and the end of August (2019). Check for the dates. The market begins at 11am on Saturdays (and lasts until 1pm) and I was lucky enough to witness its opening day last year.If you have the chance of attending the Graskaas festival, be sure to do so. Click for more information about visiting Woerden and its cheese market. Can you discuss Dutch cheese markets without discussing Alkmaar? The Alkmaar cheese market is one of the most famous and popular cheese markets in Holland. This cheese market, like many, is a reenactment, however it is one of the most elaborate and largest markets in Holland if you’re looking for a good show. For 2019, the cheese market will take place between March 29th and September 27th in the mornings starting at 10am. (There’s also an evening cheese market on Tuesdays in July and August.) You’ll want to arrive early for a good spot. Arrive early for the best place at the cheese market for photos! It begins promptly at 10 am on Fridays as it has since 1593. You can read myguide to the Alkmaar Cheese Market with tips for first-time visitors, how to visit independently, and an explanation of the traditions. If you arrive early, you can watch the cheese arrive by horse-drawn carts and boats prior to being stacked neatly. From here, the cheese will be inspected, tasted, purchased, and weighed prior to being brought to the warehouse. Have you visited a Dutch cheese market?